Nothing waste more time on the computer in my view than punching hotkeys. I know…I know, hotkeys are supposed to be a faster than using the cursor for triggering computer actions, but with Mac automation tools, hotkeys and menu items don’t always need to be manually clicked. Case and point: Say you need to copy and paste several pieces of text from one application to another. You probably first select the text, click Command+C to copy the text; switch to the next application, and then click Command+V to paste the text. Then you start the process over again. After repeating these steps several times, you may start getting annoyed. 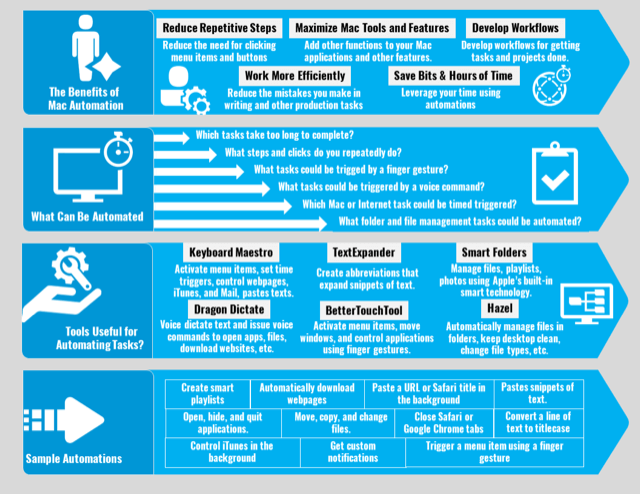 You want a faster way, with less clicking. Well there are a few ways to reduce the clicking. You could use the menu bar utility, PopClip, to copy and paste between applications, and that works great—no hotkeys to click. 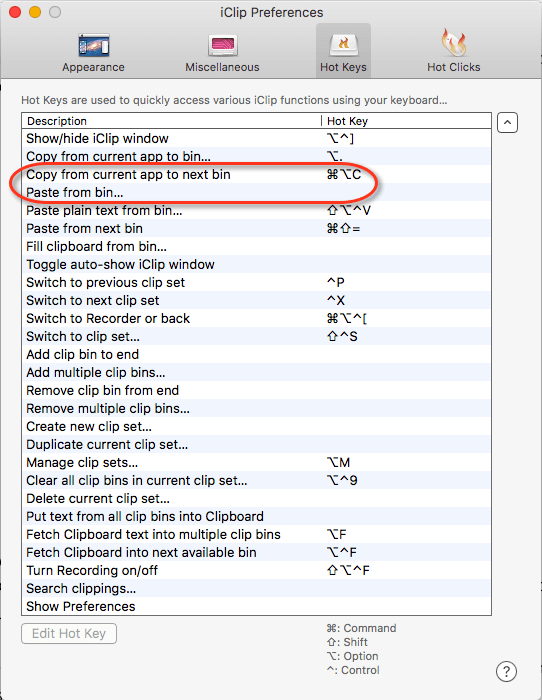 But PopClip can only save one clipping at a time to the System Clipboard. The following might be a better solution using the automation application, Keyboard Maestro and the clipboard manager, iClip. When I want to copy several items of text, I use a Keyboard Maestro macro that automatically copies selected text when I release my right-thumb off the trackpad. The macro triggers a Command+Option+C hotkey, which places the selected text in an iClip bin. With this setup, I don’t have to hassle with clicking hotkeys over and over because Keyboard Maestro handles the job for me. Now if you notice how I trigger this action, I can’t leave this macro enabled because if I do Keyboard Maestro will trigger the keystroke each time I click and release on my trackpad. 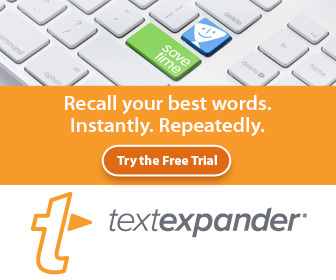 So this solution is most useful for when I have lots of text to copy. If I used this action regularly, I would trigger the macro with both the mouse release click while also holding down a selected modifier key. That way I could leave the macro enabled all the time. The great thing about using the iClip manager (affiliate link) is that it allows for adding hotkeys for over a dozen actions, including switching clipping sets, showing and hiding the iClip window, and copying all saved text in a set to the system clipboard. For my automatic copy macro, I have created a Temporary clipping set in iClip that I switch to copy my temporary clippings when I’m using the KM action. I can also create a new clipping set or use an existing set to save clippings in iClip for future use. iClip stays parked on the left side of my desktop, which makes it easy to click and paste items in the bins into another application. iClip is a powerful clipboard manager that I access for saved URLs, snippets of text, and copied images. Items can be labeled, moved or copied to between sets, and exported and archived for later use. 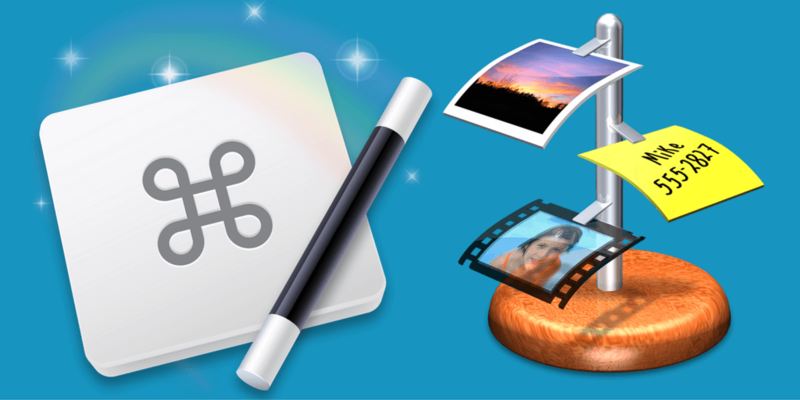 iClip is available in the Mac App Store for $14.99. I’ve also written another article about copying items to a single bin in iClip using a similar Keyboard Maestro macro. And there’s the clipboard manager feature in Alfred that you will want to use if you do a lot copying and pasting on your Mac. 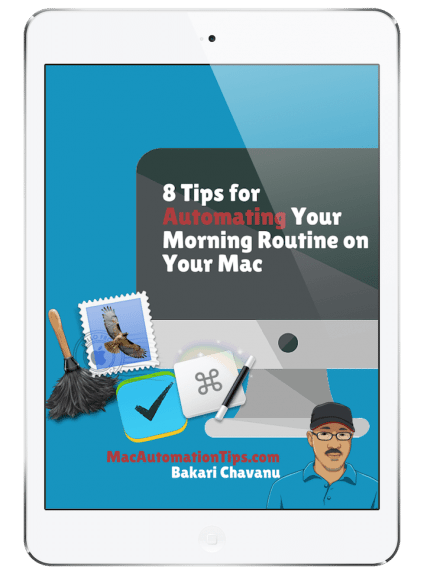 These type of hacks or actions are another example of how Mac automation tools can save clicking and performing redundant tasks. Let me know what you think of this macro setup, and what questions, if any, you have for using it. There is a PopClip Extention called “Append”. It appears as a “+” symbol. It is near the bottom of the Extention list page. With Append you can load up the system clipboard with as many clips as you like. A limitation with Append is that the next time you copy something all that is currently on the clipboard is replaced so Appending is useful for a single instance of gathering clips and pasting them. Keyboard Maestro Has a structure that allows you to archive a clipboard history to reuse later and I haven’t played with it. Awe, thanks for the tip. The append is very useful. My action is mainly for copying individual applications, whereas the append action could put all the copies on a single clipping, correct? But it’s still a good action to have. Thanks for letting us know about it. QuickKeys (poor Quickeys, sob sob) had a terrific action where pressing the Tilde key after making a selection copied it then after placing the cursor where the paste to go, pressing the Tilde key pasted the text. It was a neat action that I found useful and haven’t figured out how to recreate with Keyboard Maestro or any other app. Awe, yes, I definitely remember that Tilde key action. The action I describe in the article is based on the copy and paste action I used in QuicKeys. I wonder if that application is still working? I check once and they said it was updated for El Capitan, but I didn’t take the time to download and check it out. Thanks for your feedback, Bern. Hi, how can you record de event in the box “magic trackpad 2 button 1” ?? Hi dsz, after you select the USB Device Kay Trigger, the box should be highlighted blue. Then click on your trackpad. It the Magic Trackpad Button 1 should appear. You then select the modifier key you want to use. Have you tried that, and nothing appears? Nothing appears, only work If I press some key together. Hmm, that’s weird. 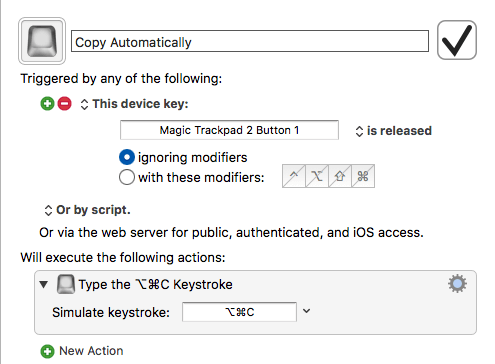 So you have to press a modification key in order for the Trackpad trigger to show? If there’s a glitch in the program, you may need to contact the Keyboard Maestro developer. He’s great about responding back. 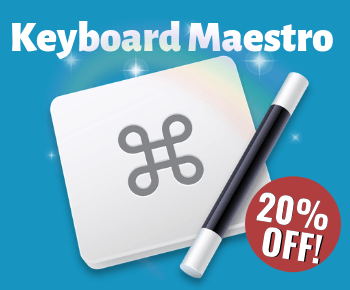 Register in this forum: https://forum.keyboardmaestro.com. Sorry I couldn’t be of more help. Blog editing in WordPress has both. Hey Bakari, I don’t get the need for or advantage of using iClip in addition to Keyboard Maestro’s already robust clipboard management features. Is there some functionality iClip adds that I’m missing? I use iClip to easily store and retrieve sets of clippings, as well as another way to access my clipboard history from iClip parked on the side of screen. I’m not too much of fan of KM’s clipboard UI, but not saying it’s not useful. It probably depends how much you use clippings. I write throughout the day, so I use three clipping apps, including Alfred’s. Thanks for your question. I might write a fuller response in an article. How are you using KM’s clippings?